Baylor 2012, the visionary strategic plan that was launched nearly 10 years ago, has been a remarkable success, and evidence of its impact on Baylor can be found in every area of university life. But, as its name suggests, that plan will enter its sunset phase in the next year. Understanding the need to sustain our powerful momentum and maintain our forward progress, the University initiated a new strategic planning process in August 2010. Those efforts began with an invitation to the Baylor family to reflect on how the University should envision its future over the course of the next decade. More than 15 months of very hard work has led to the creation of a draft plan that is now available for review. The number of those contributing to the planning process was significant. More than 700 alumni and friends participated in 19 Community Input Sessions across the country. We received nearly 300 individual submissions via our strategic planning website, and the work of a wide variety of faculty, staff and student groups on our campus resulted in 165 specific reports. Informed by the input received from the Baylor family worldwide, the draft plan reflects the broad areas of priority that will serve as a roadmap for our future. With a strong understanding of our institutional identity, the plan is now presented to you, alumni and friends, for a period of review and feedback. Printed in its entirety in the following pages, the draft plan is also available online, accompanied by a feedback form. We invite you to read the plan and thoughtfully consider feedback you would provide to specific questions you will find on our website. 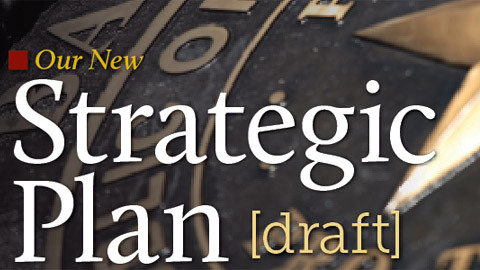 As you begin to consider the draft plan, we also invite you to view a video introduction by our executive vice president and provost, Dr. Elizabeth Davis, BBA '84, which can be found on our strategic planning website at baylor.edu/strategicplan. Through consideration of all the good input the university has received, the strategic plan now envisioned is a dynamic document intended to provide direction without dictating specific action. Because it is impossible to know exactly how the Lord may lead or what the world may need from Baylor University 10 years from now, the framework of the new strategic plan provides the flexibility necessary to position Baylor University for maximum and meaningful impact in the future. Grounded in a deep and abiding Christian faith, contributing new knowledge to the study and solution of the world's most vexing problems, and designed to equip servant leaders for generations to come, Baylor University will continue to occupy a distinct and important role in American higher education for years to come.